Yves here. Despite pundits originally anticipating that the Tories were set to deliver Labour a crushing, perhaps even party-destroying defeat in the June 8 election, aided and abetted by press and Blairite demonization of Jeremy Corbyn, the tide has turned. Labour’s release of a program backing big increases in social spending appears to mean at a bare minimum that Labour is far from dead. Voters were given a clear alternative to tired old Tory austerity policies and a meaningful number say they will vote for direct plans to deliver more support to citizens, as opposed to “Brexit will make things better” hopium. While May still has a comfortable lead, the change in handicapping has her snap election looking less clever than it did when she called it. She will still contend that it gives her a mandate for Brexit, but a less than thumping victory will mean she may not have improved her position much. And she will have diverted time and energy from preparing for Brexit negotiations. Given how her Downing Street dinner with Jean-Claude Juncker and other members of the EU team revealed how poorly briefed she was, this is a not-inconsequential cost. Labour have continued to cut the Tories’ lead in the polls after the publication of the party manifestos, as party leader Jeremy Corbyn claimed his message was “getting through” to voters. Survation research gave Theresa May’s party a lead of nine percentage points with the Conservatives dropping 5 per cent to 43 per cent in a week while Labour enjoyed a 5 per cent boost to 34 per cent. There was a similar story in four new polls published in the Sunday papers, which put Labour between 35 per cent and 33 per cent, up from the 26 points the party was showing at the start of the campaign. It appears Theresa May’s policies on social care and pensions have damaged her party’s approval rating among older voters. A separate Survation survey, conducted entirely after Thursday’s Tory manifesto launch, found 28 per cent of voters said they were less likely to vote Conservative because of the social care package, branded a “dementia tax” by opponents. Note that this is the highest Labour has scored since the Brexit vote. Oops. And the reality is that the decline in the standard of living in the UK outside London is due in large measure to Thatcherite policies. Indeed, membership in the EU if anything ameliorated the impact. And before you finger EU immigration, the UK has more non-EU immigrants. Given that the NHS and no doubt other employers have now come to depend on immigrants (10% of NHS doctors are EU immigrants), it’s not clear how the UK will wean itself of immigrants, even assuming that was a real goal. Do not forget that one of the big reasons for Tory and UKIP support of Brexit was to escape EU labor rules. This entry was posted in Brexit, Free markets and their discontents, Income disparity, Macroeconomic policy, Politics, The destruction of the middle class, UK on May 24, 2017 by Yves Smith. I don’t fault people for voting to exit the EU…it was a loud and clear signal that the present system of indefinite austerity is broken and cannot be fixed by tinkering around the edges and substituting “creative” neoliberal rhetoric for policies that benefit the 99%. However, it was sill a leap into the dark and it is bound to be a rough ride. Corbyn and his modest social democratic proposals will get the Trump treatment if he is elected to office but it’s good to see Labour starting to take some of the wind out of the Tory’s sails. They fetishize the ceremonial aspects of the democratic process over the actual intended purpose of the process. As an American liberal, I cannot think of any action or policy taken by Trump that brings a sigh of relief or approval. True liberals unequivocally oppose his actions in Syria, his withdrawal of economic support over abortion language, his dangerous rhetoric aimed at North Korea, and his disruption of international alliances, etc.. Perhaps you confuse “liberals” with Democrats? I assure you there is a radical divide there. It was supposed to be different this time, a new paradigm. Businessmen weren’t going to turn into robber barons and bankers weren’t going to behave in a reckless and destructive manner. The old 1920s economics, neoclassical economics, was dusted off after its acutely embarrassing failure in the Great Depression. Milton Freidman re-vamped it, but left the same problem that destroyed it before. It didn’t look at private debt in the economy and was unable to see the problems as they were building in the 1920s, due to debt based consumption and speculation. You get that same spike of debt based speculation before the crash. It never is different this time, there is no new paradigm. This economics was rolled out globally and the debt saturated global economy just can’t grow like it did before. If you don’t look at private debt, you can’t see the problem. What was missing has become apparent, just like private debt. The distinction was well known in the 19th Century when they repealed the Corn Laws to usher in the era of Laissez-Faire. A low cost living allows low, internationally competitive wages. Why is the minimum wage so high in the West? It must cover the cost of living. It would be interesting to see how much energy and resources that cost of living uses by country… that cost of living would include the energy and resources it takes to build and stock all those big box stores as well as maintain all the infra that gets all the stuff into them. The private debt that built up over the last few decades gave Westerners access to resource and energy rich consumption. Debt distributes energy and resources that’s why it matters. Now Westerners want to get that debt written down so they can keep on consuming resources and energy that billions of other humans deserve as well. Maybe what the UK is going through is the lag effect of losing its colonies and using the banking sector to keep the system propped up. Instead of redirecting its economy, it used financial engineering and privatized some sectors… kicking the can down the road to Brexit. This is an obfuscatory or confused distraction from a neoliberal project that facilitated a lopsided, class-based build up of private debt, via the “magic of compounding interest”, followed by class-based tax cuts. Consequently giving the ever fewer few the power to re-shape, re-form, re-structure a social order to serve them, well into the new century, while neglecting anything and everything else…for the latest chapter, see the psycho-sycophantic budgeteering of Mulhaney. What matters is mitigating and countering the viciousness and pernicious effects of usury, parasitic rent extraction and profiteering. The signs are already there that this can’t go on and I think the system will be plagued by a lack of demand. When all the mainstream economists are trained in one economics, neoclassical economics, they have been trained to not look where the problems are. Once the problems with rent seeking become over-whelming even today’s economists can see it, well a Nobel prize winner anyway. When the problem of private debt is missing you get forests that show things will improve next year. All the current data goes in and the model, that is missing the problem, shows things will improve. 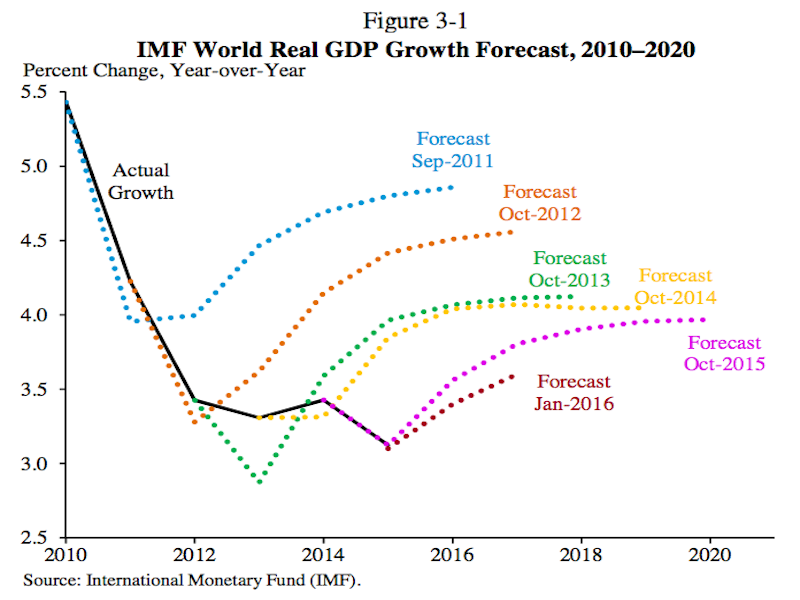 When you don’t include the debt that is causing the problem this is what your forecasts will look like. >It was supposed to be different this time, a new paradigm. It was different this time!! Very, very different: The Rich were saved… that’s all Uncle Miltie and his acolytes were aiming for. No jumping out of skyscrapers for the lords of the universe. In hindsight, I now can no longer say Friedman didn’t know what he was doing. The rich save themselves but they didn’t save the system as they left all the debt in place that will gradually drag it all down. The Central Bankers are just about keeping all that debt sustainable with today’s interest rates, nothing can return to normal until some of that debt is cleared. Global QE is still being pumped up to maintain over-inflated asset prices, this game can’t go on forever and when it stops the house of cards falls. That’s my beach reading sorted out. I wonder how many people have not ben affected by this bloodless mengelism. I have nothing like col smithers address book, but I can count three severely disabled (though heading into their thiries now)children who have been sanctioned and one adult who hung himself after that process. The anti corbyn bedwetters in westminster and the media are looking increasingly wretched in this charnel house. How many people? Here are a few… there will have been more since 2014. I know of one case personally – a man found fit for work who died of a heart attack in January this year after leaving a Jobcentre, where he had been required to “sign on” to receive any benefit pending his Work Capability Assessment appeal. No 4 on that list I knew. Personally, we did not get on,but the devestation it caused lingers terribly. It’s too long a list. After reading, then watch the Slums of London television show about life for so many in the East End in the 19th century to get a look at what the future may hold. The anti-Corbyn hysteria by the media and, in particular by the Blairites, seems to have backfired. They have created a situation whereby he will now be seen to have ‘won’ if he can hold a reasonable number of seats. The Tories were hoping to annihilate Labour as a force and the Blairites were looking for an excuse to join the Lib Dems. If the polls aren’t lying, the Lib Dems will remain irrelevant and Labour will have enough seats to form a healthy opposition. I’m not a great fan of the Observer political writer Andrew Rawnsley, but in an article a few weeks ago he stated that the best political strategy for Corbyn was not to run for PM, but to run as a ‘don’t let the Tories have things their own way’ candidate. In other words, he should acknowledge he’s not going to win, and run as a ‘spoiler’, a protest vote. I think this is what it happening, which ironically means good polls for Labour could be counter productive for Corbyn. Better to be slowly coming up the blindside as a dark horse, and he may well pull a surprise. The third point is that I think the best outcome for the left is a strong Labour showing, but a Tory majority of 20-50 seats. This means Labour won’t have to deal with the coming mess (not just Brexit, I suspect the property market will pop in the next couple of years), but allow the Conservatives to stew in it, while having a big enough parliamentary group to create a real opposition and stop the Lib Dems coming back. Anecdotal evidence I saw/heard is that peple are going to vote Labour as a protest vote, and because they like the Labour manifesto. Especially the first one often do so despite Corbyn, safe in belief that he won’t get to be the PM anyways (Trump?). I suspect that if LD didn’t get in bed with Cameron few years back, they would be getting the vote, but it’s still in too fresh a memory. Labour manifesto was really well received, but a lot of the Tory pain now is self-inflicted as well. All Labour has to do is shut up and make Tories put their feet into their mouth. IF they do want to do something, the best thing would be to insist on TV debate with May, who’s really bad on non-choreographed events, and would most likely stick both of her feet and her hands in her mouth at the same time given half a chance. A problem I think for Labour and Corbyn is that the weaker they are, the more the Tories fight among themselves and increase the general disgust with them, but when Labour are looking more threatening, the Tories always unite. So the trick for Corbyn to pull off is to look like a no-hoper, while slowly building up core support. Maybe he should ask Trump for ideas…. I can’t help feeling that there is some loss of the plot in this post. The best result for Labour is clearly a win. They will sort out the brexit mess by going for an of the shelf Norway model. The more support Corbyn is getting, the more people are realising that maybe they are not mad to like his policies after all. So there is positive feedback. The big clever thing Corbyn has done is to marginalise brexit as a topic for the election. I thought this wouldn’t work out the outset but i’ve been proven wrong. Brexit is now yesterday’s election issue. And in backing an end to university tuition fees Corbyn gets the votes of the middle class students at college, those about to go to college, and their relatives that might otherwise pay for their family to go to college. This is a real masterstroke that has destroyed the lib gems, who famously reneged on their manifesto promise not to raise tuition fees. The other masterstroke is that most of it is payed for by reversing tory tax cuts. Yes tuition fees have not been shown to prevent poorer kids going to uni but they are an excellent bribe for middle class votes as the SNP will tell you. But there must be sufficient maintenance cash to allow poor kids to study. Speaking of austerity, did anybody hear Mulvaney “defend” the gigantic funding cuts to social welfare programs in the Trump budget today? That guy is just a peach. So great is their desire to (unconsciously) ‘heighten the contradictions’ that it really does appear as though the transatlantic right-wing has become inverted and involuntary Marxists. The rot and decadence is accelerating so much faster than I could have imagined six months ago. And that is saying something my friends. I read Corbyn’s plan, but stopped when he said he would pay for everything with increased tax enforcement, and increased taxes only on the top 5% of incomes. Good luck with that. The whole point is that sensible social care and public support policies are CHEAPER than not having them. The money the Tories “save” in not creating any social housing is wasted a hundred times over paying for the devastating economic consequences of the housing shortage – a rise in homelessness, debt, and crime, driven by an increasing young underclass that simply can’t afford to have a home – which further tilts the economy towards a minority of rich private landlords. The money “saved” by underfunding and attacking the NHS creates a bill far, far larger in lost work and economic drag from people who can’t get health care they need. The Conservatives “saved” money by cutting the motability scheme to the bone. Thereby turning a lot of disabled people who *were* working and paying taxes and contributing to the economy into people who needed care and couldn’t earn a living. Think that really helped balance the budget? The best way to balance the budget is to stop letting the Conservative party loot public assets at fire-sale prices to give away to private parties. Corbyn’s plan is underfunded. But then, every single Conservative plan for the last ten years has been underfunded, based on pie-eyed fairy-tale thinking that said they could implement massive austerity without it in any way losing tax revenue. Guess what? You can’t, every economist knew that, and now they’ve lost our AAA rating and run up a massive unfunded debt. And officially abandoned the promise to pay it down. Corbyn’s economics are wishful thinking, and he’ll come up short. But It’s not a tenth as wishfful as the Conservative “the market will magicfally fix everything we don’t bother to think about” ideology, and he’s not like to run up a fraction of the debt that they have. Because at least he understands that healthy economies are generated by capital investment and functioning infrastructure, not deperately by trying to avoid ever spending money. The Bank of England is fully aware that taxes aren’t necessary to fund government spending. Funny how little this has penetrated elsewhere. As Brexit is looking to be more and more abrupt and catastrophic there will be two options for the UK: implement devastating austerity and fall into 3rd world status, or spend the necessary money into existence and unite as a society. Well, we all know what the Tories will do. Since 1980, the left has fallen on its face by falling for the right’s idea that governments must pay for what they do by collecting the appropriate amount of funds beforehand. But why would a government that can create money on the fly need to collect it from anywhere else? But the left has fallen for this and so we enter a continuous cycle where the left proposes and the right stops the left by refusing to collect the money. This is happening to Corbyn. It’s happened in Greece, and Spain, and France, and the US, and the list goes on and on. It’s why in most of the world’s advanced economies you see the left and right going in and out of leadership, over and over, without anything real ever happening. They are all stuck on the idea that governments who make their own currencies are not allowed to spend then as they are made. Can you go a little furthrter with your analysis? How does it compare with treeza’s? Why do you stop reading at a certain point? Did you miss that this was a cross post? Any introduction was more than you had a right to expect. Yet you whinge about a service that is free to you. I was replying to heraclitus, and his punctuated approach to jeremy corbyn’s policies. obviously the nesting went wrong and was probably my fault. If I start whinging, I’ll always be glad to be corrected. Does the manifesto not say he will balance the budget for current spending, not investment spending, within 5 yrs? In which case, the remaining spending would be from borrowing. Your comment seems to indicate you want others to spoon feed your thinking/analyzing to you. Round here, Ms. Smith’s work, along with Mr Strether’s… (not to omit the other guest administrators, JLS and OP) is seen for the Herculean venture it is. That was the case,my apologies. The book does not seem to include a macroeconomic discussion, in particular, it doesn’t argue that austerity is economically unnecessary. That is, there seems to be nothing on the fallacious economics of austerity. All the arguments used in this regard are fallacious. This renders austerity even more awful than it might otherwise be. Get yourself some deepak chopra if you need an all in 1 non solution. >And she will have diverted time and energy from preparing for Brexit negotiations…revealed how poorly briefed she was, this is a not-inconsequential cost. haha don’t you remember that rich guy/girl in college?…. she wouldn’t be any better briefed if she had until the sun cooled, hard work isn’t something the Conservatives do. Hard to forget that the Tories called the Brexit referendum election to cement their position. The polls showed them sailing thru and young Britons I spoke to here in Canada were sure that everyone would vote to remain. That’s the young ones, whole lives ahead of them, delighted to travel and work in exciting places –one was set to work in Spain, a couple others planned to spend some time in Berlin, where, it appears, everything interesting is happening — music, art, computer stuff. Whereas their aging parents and grandparents were probably looking at Greece. And remembering, perhaps, post-war rationing and Ms Thacher’s milk snatching. Corbyn will fail, and for the same reason the left repeatedly fails across Europe and the US. They have been convinced by the right that their governments are not allowed to create money for spending on social goods. Even as I read from the offerings of the various left wing think tanks across the continents, I can see that they have all been gotten to; that governments creating money for social good is, without reason, an anathema, and that scholars whose lives’ work has been dedicated to demonstrating otherwise are dismissed without cause from any discussions with those who can effect change. Barring dramatic social upheaval, this will not change, even as the new Nazis advance upon up. They don’t need to create money since more conventional borrowing for a stimulus would be absolutely fine. The “black hole” in their figures is therefore fine, but there is no need for MMT. Intriuging, who has tihs money thing ,and where did they get it? What do they want for it? Govts have had fiscal stimulus in the past, including a litany of stimulus packages in the US including too-late or badly spent ones. The biggies are the Depression/WW2 and the Great Recession. The public can vote for govts which borrow, so that choice should be promoted. There’s no need to try and encourage MMT when this is unnecessary and harder to believe. Actually Corbyn could win in spite of himself. I put a comment about him on Richard Murphy’s blog Tax Research to the effect that Richard had schooled him in People’s QE so why didn’t he get the fact that our government spends and then taxes and Richard’s answer was instructive ‘ He bunked the tax class ‘ . Notwithstanding this omission Corbyn is not toeing the Blairite line in this election and I detect a dent being made in the TINA belief system so long thought to be unassailable by the all parties . Brexit has brought about a fragmentation of the electorate such that , given the opportunity to boot out the incumbent ( always the norm in British Parliamentary Elections ) they may well do and then Corbyn is really on the spot . As always Thatcher, Cameron now May never explain where the “means” come from “to live within.” Of course, an electorate predominantly lacking economic and monetary literacy never think to avoid the fallacy of composition and not see the “means” as anything other than from a blindly received “household” perspective. Michael Hudson is probably correct the West will collapse like the Roman empire and a second Dark Ages ensue before the electorate realize that all the private sector “rent traps” or “toll booths” the commercial banks and shadow banks have set up were the cause! Actually, “within means” is pretty well defined even by MMT (indirectly). It’s when the inflation starts kicking in – not just a bit, but a lot. You can spend all you want until then – because it’s the inflation that shows you the demand you’re getting is outstripping the supply you can generate. And ultimately “within means” = what the supply can generate given the inputs. Unfortunately, most people (and politicians) don’t think in terms of raw possible supply demand, but in terms of _monetarily_ possible supply demand. So not so much what you _could_ produce (with inputs being the only constraint), but what you could produce given some specific stash of cash. The balance of payments constraint is another one of those myths that won’t die – based as it is on a misunderstanding by the Kaldorians of the way banks clear international payments, particularly multi-national banks in a free floating, capital movement era. The function of international clearing creates the saving on the capital account that offsets the goods/service sale in the opposite direction – automatically. For the differential to be there in the first place, the clearing must already have happened. If the finance arm isn’t in place, then the deal doesn’t happen. The constraint, if there is one, is “where else are you going to sell your stuff if not here?”.